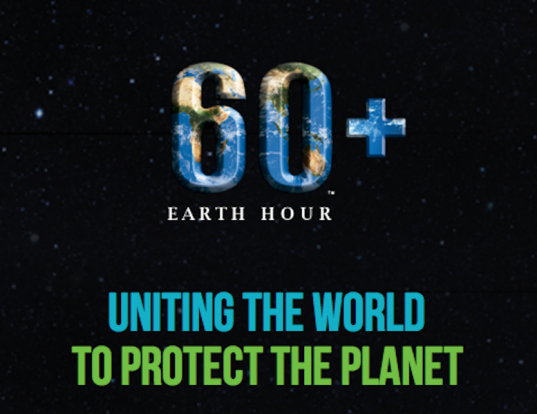 Earth Hour is that time of year when at 8.30pm on the 23rd of March we all think about our Biosphere for one hour. If we can, let’s turn our lights out for just one hour and show the Biosphere our love… it’s fun and shows those in authority just how many of us care about our planet! WWF’s Earth Hour is a unique annual phenomenon that focuses the world’s attention on our amazing planet and how we need to protect it. At 8.30pm on 23 March hundreds of millions of people will turn off their lights for one hour, on the same night, all across the world in a huge, symbolic show of support. Make sure you’ll be doing it in the dark at 8.30pm on 23 March. Together we can make change happen.